Thank you for your interest in St. John Catholic School, the only Catholic school in Carroll County. You will discover that we are more than a school. We are a family, working together to grow closer to God on our path to discipleship. St. John School has been educating students in Carroll County for over 150 years. As we have grown and changed through the years, our focus has not. Jesus has been and will continue to be our focus for all we do. 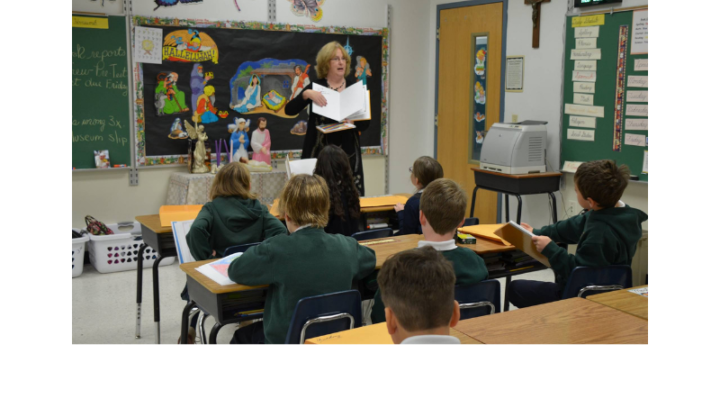 The mission of St. John Catholic school is to inspire all students to become Disciples of Christ through an engaging, nurturing and exemplary education-one child at time. Students participate in weekly Mass, daily prayer, devotional prayer in the adoration chapel and daily religion lessons all to deepen their relationship with Jesus and follow HIS light. Our academic programing is child-centric, allowing each student to develop to his/her full potential. Our 21st Century curriculum standards prepare the students for success in our ever-changing world. We have Innovation Labs, where students will engage in collaborative hands-on inquiry-based learning. Technology with our 3D printers, iPads, and computer lab will be integrated into daily lessons. St. John students are well prepared for high school and beyond when they graduate 8th grade. Additionally, St. John School offers a variety of extra-curricular activities for students. We have a cross-country team, and an equestrian team, as well as offer running club, drama club, choir, robotics, art club, band and Lego club. Students can also participate in CYO basketball. There is something for everyone! Another distinguishing aspect of St. John School is our highly qualified and dedicated faculty who work tirelessly to insure the needs of each child are met. The teachers get to know all of their students and help them grow spiritually, socially, emotionally and academically. We welcome you to become part of the St. John family. If you have any questions, please do not hesitate to contact the office. Mrs. Jo Marie Tolj M.Ed.